For keyboards that stand up to the rigors of constant, everyday use and abuse from liquids, chemicals and other contaminants, choose the best waterproof keyboards made by Man & Machine. Medical offices, hospitals and dental clinics looking for quality and value in exam/operating room keyboards as well as keyboards for clerical use need to be sure that the waterproof keyboard they are using will withstand disinfecting cleaners. 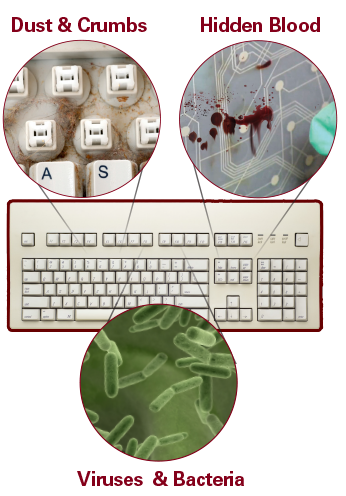 So-called ‘antimicrobial keyboards’ are not practical for today’s clinical environments – they take too long to be effective, they don’t eliminate build-up of bio-contaminants and they are ineffective in areas where there is low-humidity. The only way to keep a keyboard germ-free is to clean it regularly with disinfectant and the only kind of keyboard that will hold up to the strong chemicals in disinfectants is our waterproof keyboards. Our keyboards are customizable – you can design your own with options such as backlights, magnets and custom cable lengths. There are even wireless keyboard solutions for your facility that will provide your staff with the ultimate flexibility. Oil- and grease-proof keyboards need to be built for rugged, challenging environments. Man & Machine has incorporated a full-sized keyboard into its design for industrial applications. Silicon construction means these keyboards are dust-proof and waterproof and sealed to keep contaminants out. Backlights, magnets and custom cable lengths offered as options with our industrial keyboards give you the option to tailor your keyboard to specific workstation requirements. Public safety applications are demanding environments where reliability and durability are just as important as water resistance. Man & Machine’s rugged keyboards can take the abuse of the road without rattling. They are made from solid silicone which means they are completely waterproof and have no moving parts to break. 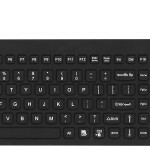 These keyboards are backlit and are compatible with the mounting systems on standard equipment. In sum, this is the keyboard that will perform 24/7 in police vehicles, ambulances, and fire trucks or any service or utility vehicle. Man & Machine waterproof keyboards provide you with the value, the features and the dependability required in critical environments.